An announcement made at AnimeJapan 2014 revealed that a new 2-episode OVA for Suisei no Gargantia will be released with the first episode coming Fall 2014. The screening event for the first OVA was announced as well. More information on the OVA will be given at a later time. 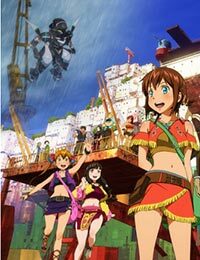 Watch Suisei no Gargantia: Meguru Kouro, Haruka Episodes Online at Animegg.org. Suisei no Gargantia: Meguru Kouro, Haruka is available in High Definition only through Animegg.org. Choose an episode below and start watching Suisei no Gargantia: Meguru Kouro, Haruka in Subbed & Dubbed HD now.